Objectives Rituximab is an effective treatment in patients with established rheumatoid arthritis (RA). The objective of the IMAGE study was to determine the efficacy of rituximab in the prevention of joint damage and its safety in combination with methotrexate (MTX) in patients initiating treatment with MTX. Methods In this double-blind randomised controlled phase III study, 755 MTX-naïve patients with active RA were randomly assigned to MTX alone, rituximab 2×500 mg + MTX or rituximab 2×1000 mg + MTX. The primary end point at week 52 was the change in joint damage measured using a Genant-modified Sharp score. Results 249, 249 and 250 patients were randomly assigned to MTX alone, rituximab 2×500 mg + MTX or rituximab 2×1000 mg + MTX, respectively. 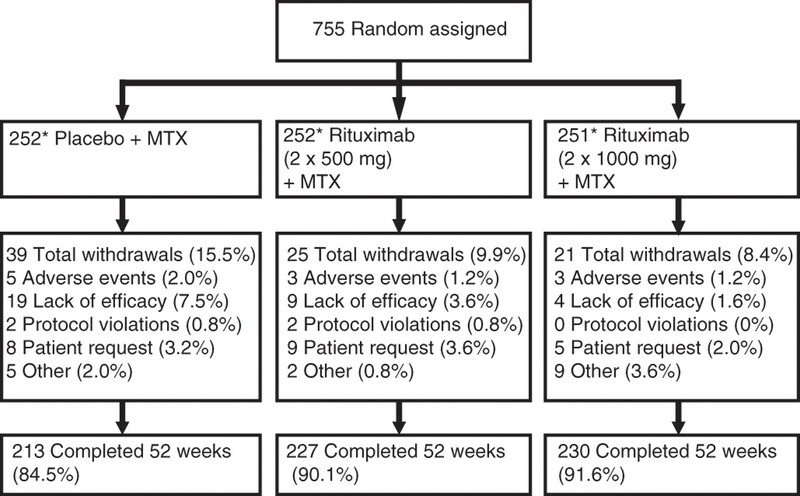 At week 52, treatment with rituximab 2×1000 mg + MTX compared with MTX alone was associated with a reduction in progression of joint damage (mean change in total modified Sharp score 0.359 vs 1.079; p=0.0004) and an improvement in clinical outcomes (ACR50 65% vs 42%; p<0.0001); rituximab 2×500 mg + MTX improved clinical outcomes (ACR50 59% vs 42%; p<0.0001) compared with MTX alone but did not significantly reduce the progression of joint damage. Safety outcomes were similar between treatment groups. Conclusions Treatment with rituximab 2×1000 mg in combination with MTX is an effective therapy for the treatment of patients with MTX-naïve RA. Rheumatoid arthritis (RA) is a chronic inflammatory disease in which early aggressive treatment with disease-modifying antirheumatic drugs (DMARDs) can improve outcomes and prevent joint damage. Treatment recommendations for the management of early arthritis concluded that the main goal of treatment is clinical remission, in order to prevent structural joint damage and long-term disability.1 2 These recommendations acknowledge that patients with disease features of poor prognosis—for example, high disease activity and the presence of autoantibodies (rheumatoid factor (RF) and/or anticitrullinated peptide antibodies (ACPA))—should be considered as candidates for the early introduction of biological therapies. Rituximab is a therapeutic monoclonal antibody that selectively depletes CD20+B cells. The combination of rituximab with methotrexate (MTX) significantly improves disease symptoms in patients with RA who have an inadequate response to conventional DMARD therapy, and ameliorates disease symptoms and protects against joint damage in patients who have had an inadequate response to TNF inhibitors.7,–,9 The aim of this study was to investigate the early therapeutic introduction of rituximab in patients with active RA not previously treated with MTX. Patients were recruited between January 2006 and September 2007 from 169 centres in Europe, the USA, Latin America, Asia and Australia. Eligible patients were aged 18–80 years with RA diagnosed according to the revised 1987 American College of Rheumatology (ACR) criteria.10 Disease duration was ≥8 weeks but ≤4 years. Patients were not to have received previous treatment with MTX and were to have active disease defined as a swollen joint count (66 joints) and tender joint count (68 joints) both ≥8 at screening and baseline, and C-reactive protein (CRP) ≥1.0 mg/dl. Patients seronegative for RF required radiographic evidence of erosive damage attributable to RA. This study was conducted in accordance with the ethical principles of the Declaration of Helsinki and adhered to the principles outlined in the Guideline for Good Clinical Practice ICH Tripartite Guideline (January 1997). Patients were randomised to receive rituximab (2×500 mg or 2×1000 mg) or placebo in addition to initiating MTX. The randomisation schedule, stratified by region (USA or rest of world) and RF status (positive or negative), was generated by the sponsor and supplied to an Interactive Voice Response System (IVRS). At randomisation, patients were assigned unique medication and randomisation numbers via the IVRS. The sponsor, investigators and patients were blinded to treatment allocation until week 52, at which time the sponsor was unblinded for the purposes of data analysis. Rituximab/placebo was administered by intravenous infusion on days 1 and 15, with all infusions (including placebo) premedicated with intravenous methylprednisolone 100 mg. Oral MTX in all patients was commenced at 7.5 mg/week and escalated up to 20 mg/week by week 8 as tolerated. Repeat courses of rituximab/placebo were permitted from week 24. Patients eligible for re-treatment were those with a Disease Activity Score in 28 joints (DAS28-ESR) ≥2.6.11 Patients with DAS28-ESR <2.6 were re-treated if and when this increased to ≥2.6. Further courses were permitted 24 weeks following each course based on the same criteria. Concomitant glucocorticoids (≤10 mg/day prednisolone or equivalent) and non-steroidal anti-inflammatory drugs were permitted with doses kept stable. Intravenous or intramuscular glucocorticoids and additional DMARDs (non-biological or biological) were prohibited. Adverse events were recorded throughout the study and graded according to the National Cancer Institute Common Terminology Criteria for Adverse Events, version 3. Based on simulations using distributions that match the data published from the ASPIRE study,3 with data analysed using non-parametric tests and the closure principle for multiplicity adjustment, a planned sample size of 250 patients per group was expected to give >90% power to detect differences between each rituximab group and MTX alone. Radiographic analyses were performed on a modified intent-to-treat (mITT) population, defined as randomised patients who received study medication and for whom a baseline and at least one post-baseline x-ray were available. Missing values at week 52 were imputed by linear extrapolation. For changes in radiographic scores, a global test was performed using the Kruskal–Wallis test to control for multiplicity, with primary comparisons made using a non-parametric test (Van Elteren) for the individual rituximab dose groups versus MTX alone, adjusting for baseline stratification factors (region and RF status). The difference in the proportions of patients without radiographic progression was tested using the Cochran–Mantel–Haenszel (CMH) test, also adjusting for baseline stratification factors; if progression status could not be determined, the patient was classed as ‘progressed’. Radiographic non-progression was defined as a change in total modified Sharp score ≤0. Clinical efficacy of rituximab versus placebo was analysed using the CMH test for categorical end points and analysis of variance (ANOVA) for continuous end points, adjusting for baseline stratification factors. ANOVA models also included the end point baseline value if applicable (eg, for analysis of change in DAS28-ESR and HAQ-DI). Missing data were imputed using the non-responder method for ACR, EULAR and MCR (all patients who withdrew or received a non-permitted DMARD were classed as non-responders) and the last observation carried forward for all other end points. Overall, 755 patients were randomised with 748 included in the ITT and safety analyses and 715 in the mITT analysis for radiographic outcomes. Baseline demographic and disease characteristics were balanced across treatment groups and indicated that this was an early MTX-naïve RA population with highly active disease (mean DAS28-ESR 7.0–7.1, mean tender joint count 32.7–34.0, mean swollen joint count 20.0–22.4) and a high degree of functional impairment (table 1). Approximately 90% of treated patients completed up to the week 52 primary end point, with the primary reason for early withdrawal in all groups being lack of therapeutic response (figure 1). Patient disposition. *Patients are grouped according to treatment received. Note that seven patients were randomised and not treated; these patients are grouped under their randomised treatment group (two placebo + MTX, three rituximab 2×500 mg + MTX, two rituximab 2×1000 mg + MTX); three patients received incorrect medication for their first treatment course (one placebo + MTX patient received rituximab 2×500 mg; one rituximab 2×500 mg + MTX patient received placebo + MTX; one rituximab 2×1000 mg + MTX patient received placebo + MTX). MTX, methotrexate. Most patients (80–84%, balanced across treatment groups) received a second course of treatment. The majority of second courses (approximately 80%) were administered by week 30. A higher proportion of patients treated with MTX alone received a third course compared with either rituximab group (44% vs 37% and 36%, respectively). The mean dose of MTX was >18 mg/week in all groups by week 8 (median dose 19–20 mg/week). 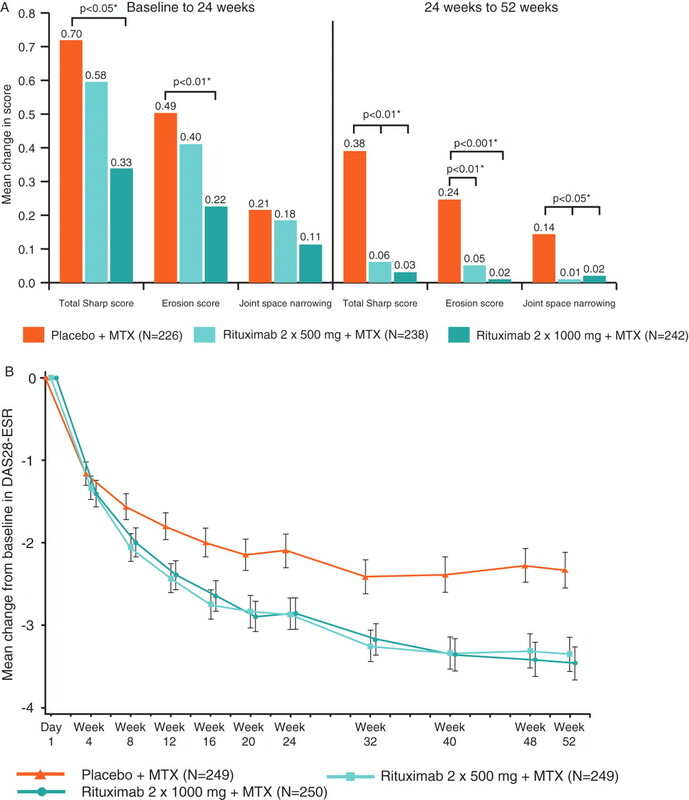 At the week 52 primary end point analysis, rituximab 2×1000 mg + MTX was associated with a significant reduction in the progression of joint damage compared with MTX alone (mean change in mTSS 0.359 vs 1.079; p=0.0004; table 2). The robustness of the primary outcome was supported by numerous sensitivity analyses, including the per-protocol analysis and analyses using various imputation rules for missing data. A cumulative probability plot showing the change from baseline to week 52 in mTSS for the ITT population (figure S1 in online supplement) shows that the highest proportion of non-progressors was observed in patients in the rituximab 2×1000 mg group. Patients with larger changes in mTSS, and therefore more rapid progression, were mainly limited to the MTX alone group (see figure S1 in online supplement). Although slower progression of joint damage was also observed with rituximab 2×500 mg + MTX, the difference did not achieve statistical significance compared with MTX alone. An exploratory analysis indicated that rituximab 2×1000 mg + MTX resulted in slower progression of joint damage versus rituximab at the lower dose (p=0.0369). This apparent difference between the rituximab doses was extensively explored and did not appear to be due to small numbers of rapidly progressing patients in the lower dose group; indeed, separation of the doses was observable from the 70th percentile. Multiple robustness analysis also demonstrated significant outcomes only with the higher dose. Secondary radiographic end points reflected that of the primary assessment, with significantly reduced progression of erosive damage and higher proportions of patients with no progression of joint damage (defined as change in mTSS score ≤0) (table 2) in the rituximab 2×1000 mg + MTX group versus MTX alone. A reduction in the progression of joint damage in the rituximab 2×1000 mg + MTX arm was evident by 24 weeks, with a markedly slower rate of change from 24 to 52 weeks. During this second 6-month period, both doses of rituximab reduced the progression of joint damage (including erosion and joint space narrowing) versus MTX alone (figure 2A). (A) Progression of joint damage from baseline to 24 weeks and from 24 to 52 weeks (intent-to-treat population). *Adjusted p values versus placebo. Missing values were imputed using linear extrapolation using baseline and week 24 radiographs. (B) Change in DAS28-ESR over 52 weeks (intent-to-treat population). Error bars represent ±1.96×SEM. DAS28, Disease Activity Score in 28 joints; ESR, erythrocyte sedimentation rate; MTX, methotrexate. At week 52 both doses of rituximab + MTX were associated with improved clinical outcomes compared with MTX alone across a broad range of end points including significantly higher proportions of patients achieving ACR20, 50, 70 and 90 responses (table 2). MCRs were achieved in 8%, 18% (p=0.0015) and 21% (p<0.0001) of patients in the MTX alone, rituximab 2×500 mg and rituximab 2×1000 mg groups, respectively. Greater decreases from baseline in DAS28-ESR were observed in both the rituximab 2×500 mg and 2×1000 mg groups compared with MTX alone from week 8 through to week 52 (figure 2B), with significant differences from baseline observed at week 52 versus MTX alone (adjusted mean −3.05 and −3.21 vs −2.06; p<0.0001 for both). Within both rituximab groups the incidence of remission (defined as DAS28-ESR <2.6) increased throughout the study period and by week 52 was achieved in 13%, 25% and 31% in the MTX alone, rituximab 2×500 mg and rituximab 2×1000 mg groups, respectively (p<0.001 for both rituximab groups; see table 2 and figure S2 in online supplement). EULAR good responses were achieved in significantly higher proportions of patients in both rituximab groups versus MTX (table 2). Improvement in function as determined by mean changes in the HAQ-DI from baseline to week 52 was significantly greater in the rituximab 2×500 mg and 2×1000 mg groups compared with MTX alone (−0.905 and −0.916 vs −0.628, respectively; p<0.0001 for both), with higher proportions of patients achieving an MCID than in the MTX alone group (table 2). Subgroup analysis indicated that treatment effects were observed across multiple end points in the majority of subgroups based on baseline characteristics (change in mTSS across subgroups is shown in table S1 in the online supplement). This included patients with high disease activity, elevated inflammatory markers, and RF- and/or ACPA-seropositive disease. Responses in patients seropositive for RF and/or ACPA were enhanced compared with patients seronegative for both autoantibodies across most end points (table 2). As with all subgroups with relatively small sample sizes, the data in the seronegative subgroup should be interpreted with caution. Adverse events were reported in 81%, 76% and 79% of patients treated with MTX alone, rituximab 2×500 mg or rituximab 2×1000 mg, respectively, with serious adverse events in 10%, 9% and 10%, respectively (table 3). Adverse events leading to withdrawal included exacerbation of RA (five patients in the MTX alone group) and infusion-related reactions (one patient in the rituximab 2×500 mg group and three patients in the rituximab 2×1000 mg group). There were three deaths (two cases of pneumonia, including a case of Pneumocystis jiroveci pneumonia (PJP) and one cerebral infarct), all of which occurred in the MTX alone group. Infusion-related reactions, consisting predominantly of throat irritation, pruritus, rash and fever, were most frequent in patients in the rituximab 2×1000 mg + MTX group; however, this was apparent only for the first infusion of the first course with frequency of infusion-related reactions similar in all groups thereafter (table 3). Serious infections were reported more frequently in the MTX alone group (5%) than in either rituximab group (2% and 3% for the 2×500 mg and 2×1000 mg groups, respectively), with rates of serious infections per 100 patient-years' exposure also higher in this group (table 3). There were two opportunistic infections (both PJP), one in the rituximab 2×500 mg group, which resolved with treatment, and one in the MTX alone group, which was fatal. Progressive multifocal leucoencephalopathy was not observed in this study. This is the first study of initiating a targeted B cell therapy in MTX-naïve patients with active RA. Over 52 weeks the study showed that, compared with MTX alone, rituximab 2×1000 mg + MTX was significantly more effective in inhibiting the progression of joint damage and in improving clinical outcomes in a population of patients with RA, of whom approximately 90% were seropositive for RF and/or ACPA autoantibodies. Although the lower dose of rituximab (2×500 mg) was associated with improved symptoms, this dose did not meet the primary end point of reducing joint damage. Both doses of rituximab were highly effective in relieving the signs and symptoms of RA. Importantly, the proportions of patients achieving high-hurdle end points, including those with 90% improvement in their disease symptoms (ACR90) as well as those achieving DAS28-ESR remission, were significantly greater with rituximab + MTX compared with MTX alone. Responses were sustained over time, as demonstrated by significantly higher proportions of patients achieving an MCR in both rituximab groups. Functional ability was also improved with significantly greater mean changes in the HAQ-DI in both rituximab treatment groups compared with MTX alone, as well as higher proportions of patients achieving clinically meaningful changes. Given that the HAQ-DI is a major predictor of work disability as well as costs of disease treatment,17 its significant improvement in this young and functionally impaired patient population is of particular clinical relevance. Rituximab 2×1000 mg significantly reduced the progression of joint damage within 6 months. Importantly, the degree of inhibition was notably greater from weeks 24 to 52, with a 91% reduction in the progression of joint damage compared with MTX alone. Exploratory analysis also showed significant effects on reducing joint damage in the rituximab 2×500 mg group during this second 6-month period. The slower onset of radiographic inhibition with this dose is in contrast to that observed for clinical outcomes, which were comparable over time for both doses of rituximab (figure 2B). Disconnects between clinical responses and radiographic outcomes with rituximab and with TNF inhibitors have been reported18 19; however, the finding that different doses of the same therapeutic agent have similar clinical effects but differential radiographic outcomes is unusual. A definitive explanation is unknown; however, one hypothesis may be related to the ability of the rituximab 2×1000 mg dose to induce more complete B cell depletion in non-peripheral compartments.20 21 In this model, more pronounced depletion of synovial B-lineage cells is required for radiographic relative to clinical outcomes. Thus, the influence of B cells may have a different dynamic to the effects that are related to clinical responses. This hypothesis may be supported by studies in monkeys, which have shown greater B cell depletion in lymphoid tissues following repeat treatments.22 Given that a high proportion of patients in all groups received re-treatment in the current study, more complete depletion in the synovium following re-treatment may provide some explanation as to the enhanced effect on joint damage observed in the second half of the study. This observation also suggests that the labelled dose of rituximab 2×1000 mg remains appropriate since this was the only dose that both improved clinical symptoms and significantly inhibited progression of joint damage. However, whether continued repeat treatment with this dose or the lower dose of 2×500 mg is optimal has not been addressed in this study and is perhaps an area for further investigation. Importantly, compared with MTX alone, improved clinical and radiographic outcomes were observed with rituximab + MTX in patients with accepted markers of progressive disease (eg, high disease activity or CRP). Consistent with previous reports,23 24 outcomes were enhanced in patients seropositive for RF or ACPA at baseline compared with patients who were seronegative for both. The safety profile in this early RA cohort is consistent with that published with rituximab in patients with later stage disease7 25 with no new or unexpected safety findings observed. The rate of serious infection was low and consistent with rates previously published for rituximab in RA.26 Two opportunistic infections were reported, both of which were cases of PJP (including one in a patient receiving MTX alone with a fatal outcome). Although the incidence of PJP in patients with RA is thought to be low, cases have been reported with low-dose MTX as well as in patients treated with biological therapies.27 28 With the exception of the frequency of infusion-related reactions to the first infusion of the first treatment course, the safety profiles between the two rituximab dose groups were comparable. In summary, this is the first evidence that targeted B cell depletion with rituximab 2×1000 mg + MTX is an effective and well-tolerated therapy for the treatment of MTX-naïve RA. The critical treatment goals of disease remission, inhibition of joint damage and improved functional ability were all significantly improved compared with the standard of care treatment (MTX) in this important patient population. The authors thank Laura Burke, Chris Mela, Lesley Gazely and Gillian Armstrong (Roche Products Ltd) who all contributed to the analysis and interpretation of the data. Support for third-party writing assistance for this manuscript, furnished by Julie Gray, was provided by Adelphi Communications. The authors were responsible for critical revisions of the manuscript and for important intellectual content.
. American College of Rheumatology. American College of Rheumatology 2008 recommendations for the use of nonbiologic and biologic disease-modifying antirheumatic drugs in rheumatoid arthritis. Arthritis Rheum 2008;59:762–84.
. Active-Controlled Study of Patients Receiving Infliximab for the Treatment of Rheumatoid Arthritis of Early Onset Study Group. Combination of infliximab and methotrexate therapy for early rheumatoid arthritis: a randomized, controlled trial. Arthritis Rheum 2004;50:3432–43.
. TEMPO (Trial of Etanercept and Methotrexate with Radiographic Patient Outcomes) study investigators. Therapeutic effect of the combination of etanercept and methotrexate compared with each treatment alone in patients with rheumatoid arthritis: double-blind randomised controlled trial. Lancet 2004;363:675–81.
. REFLEX Trial Group. Rituximab for rheumatoid arthritis refractory to anti-tumor necrosis factor therapy: Results of a multicenter, randomized, double-blind, placebo-controlled, phase III trial evaluating primary efficacy and safety at twenty-four weeks. Arthritis Rheum 2006;54:2793–806.
. Efficacy and safety of different doses and retreatment of rituximab: a randomised, placebo-controlled trial in patients who are biological naïve with active rheumatoid arthritis and an inadequate response to methotrexate (Study Evaluating Rituximab's Efficacy in MTX iNadequate rEsponders (SERENE)). Ann Rheum Dis 2010;69:1629–35.
. Rituximab inhibits structural joint damage in patients with rheumatoid arthritis with an inadequate response to tumour necrosis factor inhibitor therapies. Ann Rheum Dis 2009;68:216–21.
. Development and validation of the European League Against Rheumatism response criteria for rheumatoid arthritis. Comparison with the preliminary American College of Rheumatology and the World Health Organization/International League Against Rheumatism Criteria. Arthritis Rheum 1996;39:34–40.
. Minimum important difference between patients with rheumatoid arthritis: the patient's perspective. J Rheumatol 1993;20:557–60.
. Appropriate and effective management of rheumatoid arthritis. Ann Rheum Dis 2004;63:627–33.
. Disconnect between inflammation and joint destruction after treatment with etanercept plus methotrexate: results from the trial of etanercept and methotrexate with radiographic and patient outcomes. Arthritis Rheum 2006;54:3119–25.
. Inhibition of radiographic progression with rituximab is not dependent on clinical efficacy: results from a study in rheumatoid arthritis patients with an inadequate response to one or more TNF inhibitors (REFLEX). Ann Rheum Dis 2007;66(Suppl II):431.
. Synovial tissue response to rituximab: mechanism of action and identification of biomarkers of response. Ann Rheum Dis 2008;67:917–25.
. Targeting B cells in immune-mediated inflammatory disease: a comprehensive review of mechanisms of action and identification of biomarkers. Pharmacol Ther 2010;125:464–75.
. Depletion of B cells by a humanized anti-CD20 antibody PRO70769 in Macaca fascicularis. J Immunother 2005;28:212–19.
. Autoantibody-positive rheumatoid arthritis (RA) patients (pts) have enhanced clinical response to rituximab (RTX) when compared with seronegative patients. Ann Rheum Dis 2009;68(Suppl 3):442.
. Baseline autoantibody status (RF, anti-CCP) and clinical response following the first treatment course with rituximab. Arthritis Rheum 2006;54(Suppl 9):833.
. DANCER Study Group. The efficacy and safety of rituximab in patients with active rheumatoid arthritis despite methotrexate treatment: results of a phase IIB randomized, double-blind, placebo-controlled, dose-ranging trial. Arthritis Rheum 2006;54:1390–400.
. Long-term safety of rituximab: follow-up of the RA clinical trials and re-treatment population. Ann Rheum Dis 2009;68(Suppl 3):76.
. Pneumocystis carinii pneumonia associated with low dose methotrexate treatment for rheumatoid arthritis. Scand J Rheumatol 1994;23:51–3.
. Pneumocystis jiroveci pneumonia in patients with rheumatoid arthritis treated with infliximab: a retrospective review and case-control study of 21 patients. Arthritis Rheum 2009;61:305–12. IMAGE Investigators Aelion J (Arthritis Clinic, Jackson, TN, USA); Afif N (Centre Hospitalier De Mulhouse-Hôpital, Emile Muller, France); Ahmadi F (Centrallasarettet, Västerås, Sweden); Aires F (Hospital Universitário De Brasília, Brazil); Alanis E (Clinica San Jose, Obregon, Mexico); Alonso CS (Centro De Investigacion Del Noroeste, S.C. Tijuana, Mexico); Alten R H-E (Schlosspark Klinik, Berlin, Germany); Alvaro-Gracia JM (Hospital De La Princesa, Madrid, Spain); Ashrafzadeh A (Pacific Arthritis Care Center, Los Angeles, CA, USA); Ballina J (Hospital University Central, De Asturias, Oviedo, Spain); Bambara L-M (Policlinico G. B. Rossi, Verona, Italy); Bao C (Renji Hospital, Shanghai, China); Bell M (Sunnybrook Health Science Centre, Toronto, Canada); Berney S (Louisiana State University Medical Center, Shreveport, LA, USA); Bessette L (Groupe De Recherche en Rhumatologie et Maladies Osseuses, Quebec City, Canada); Birbara C (Clinical Pharmacology Study Group, Worcester, MA, USA); Boling E (Boling Clinical Trials, Upland, CA, USA); Bourgeois P (Hôpital Pitié, Salpêtrière, Paris, France); Braun J (Rheumazentrum-Ruhrgebiet, St Josefs-Krankenhaus, Herne, Germany), Briones H (Private Practice, Guatemala City, Guatemala); Brzezicki J (Wojewodzki Szpital, Zespolony, Elblag, Poland); Burgos-Vargos R (Clinica Para El Diagnostico y Tratamiento de las Enfermedades Reumaticas Sc, Mexico City, Mexico); Burmester G (Charité–Uni Medizin, Berlin, Campus Mitte, Berlin, Germany); Burnett M (Tampa Medical Group, Tampa, FL, USA); Busch H (Family Arthritis Center, Jupiter, FL, USA); Cabello E (Hospital Alberto, Sabogal Sologuren, Callao, Peru); Calvo A (Clinica San Felipe, Lima, Peru); Cantagrel A (Hôpital Rangueil, Toulouse, France); Cantini F (Ospedale Misericordia, Dolce, Prato, Italy); Carlos Zea A (Hospital Ramon Y Cajal, Madrid, Spain); Carreño Perez L (Hospital General University Gregorio Maranon, Madrid, Spain); Chavez J (Reumacentro Sac, Lima, Peru); Cheoi Shim S (Eilji University Hospital, Daejeon, South Korea); Chindalore V (Pinnacle Research Group, Aniston, AL, USA); Chiriac R (Spitalul Clinic De Recuperare, Iasi, Romania), Codding C (Health Research of Oklahoma, Oklahoma City, OK, USA); Danda D (Christian Medical College and Hospital, Vellore, India); Del Guidice J (Arthritis Associates, Lubbock, TX, USA); De Vita S (Policlinico University, Udine, Italy); Digiovanni R (DMI Health Care Group Inc, Largo, FL, USA); Dikranian A (San Diego Arthritis and Osteoporosis Medical Clinic, San Diego, CA, USA); Eider W (Clinical Trials Northwest, Yakima, WA, USA); Fantini F (A O Istituto Ortopedico Gaetano Pini, Milano, Italy); Ferraccioli G (University of Cattolica Del Sacro Cuore, Roma, Italy); Fietchner J (Fietchner Research, East Lansing, MI, USA); Filipowicz-Sosnowska A (Instytut Reumatologii Im Prof Dr Hab Eleonory Reicher, Warszawa, Poland); Finnanger B (Sykehuset Ostfold Sarpsborg HF, Sarpsborg, Norway); Fiocco G (Gundersen Clinic, Onalaska, WI, USA); Fleck M (Klinik Der Uni Regensburg, Germany); Fleischmann R (Metroplex Clinical Research, TX, USA); Fraser A (Graves-Gilbert Clinic, KY, USA); Gaudin P (Centre Hospitalier Universitaire de Grenoble, France); Gauler G (Rheumatologische, Gemeinschaftspraxis, Osnabrück, Germany); Gaylis N (Arthritis and Rheumatism, Disease Specialties Aventura, FL, USA); Gerlag DM (AMC/University of Amsterdam, Amsterdam, The Netherlands); Godde J (Hôpital Saint Joseph, Marseille, France); Gomez Reino JJ (Hospital Clinico Uni De Santiago, Santiago De Compostela, Spain); Gornisiewicz M (Rheumatology Consultants, Knoxville, TN, USA); Gough W (Asheville Rheumatology and Osteoporosis Research Associates, Asheville, NC, USA); Greenwald M (Desert Medical Advances, Palm Desert, CA, USA); Guerra G (Isthmian Medical Research, Panama City, Panama); Hackshaw K (Ohio State University Columbus, OH, USA); Haentzschel HM (Med-Poliklinisches Institut Der Univ Leipzig, Leipzig, Germany); Hammond T (Maidstone Hospital, Maidstone, UK); Hazleman BL (Addenbrooke's Hospital, Cambridge, UK); Heilig B (Rheumapraxis Heidelberg, Heidelberg, Germany); Herenius MMJ (AMC/University of Amsterdam, Amsterdam, The Netherlands); Hilliquin P (Hôpital Sud Francilien Corbeil-Essonnes, France); Holt D (Hospital Alberto Sabo Spartanburg Medical Research Spartanburg, SC, USA); Huang F (General Hospital of Chinese PLA, Beijing, China); Huff J (Arthritis and Osteoporosis Center of South Texas, San Antonio, TX, USA); Huizinga T (Academisch Ziekenhuis Leiden, Leiden, The Netherlands); Isaacs J (Freeman Hospital, Newcastle upon Tyne, UK); Jaffer A (Allergy and Rheumatology Center, La Jolla, CA, USA); Jason Amante E (Asian Hospital and Medical Center, Manila, Philippines); Jeka S (Szpital Wojewodzki Im, Dr Jana Biziela, Bydgoszcz, Poland); Jimenez R (Seattle Arthritis Clinic, Seattle, WA, USA); Jones G (Menzies Research Institute, University of Tasmania, Hobart, Tasmania); Jones R (Clinic for Rheumatic Diseases, Tuscaloosa, AL, USA); Kaine J (Sarasota Arthritis Center, Sarasota, FL, USA); Kashif A (Arthritis and Osteoporosis Consultants of Carolinas, Charlotte, NC, USA); Kaufmann C (Sykehuset I Buskerud HF, Drammen, Norway); Kay J (Massachusetts General Hospital, Boston, MA, USA); Khraishi M (Nexus Clinical Research Centre, St John's, Canada); Kivitz A (Altoona Center for Clinical Research, Duncansville, PA, USA); Klinkhoff A (Arthritis Research Centre, Vancouver, Canada); Kraag G (Ottawa Hospital, Riverside Campus, Ottawa, Canada); Krystufkova O (Research Institute of Rheumatic Diseases, Praha, Czech Republic); Kucharz E (Samodzielny Publiczny, Szpital Kliniczny Nr Sl.A.M., Katowice, Poland); Lawson J (Piedmont Arthritis Clinic, Greenville, SC, USA); Leirisalo-Repo M (Helsinki University Hospital, Helsinki, Finland); Levin R (Dunedin, FL, USA); Liang G (Northwestern University, Chicago, IL, USA); Liang P (CHUS Hôpital Fleurimont, Sherbrooke, QC, Canada); Limonta M (Ospedali Riuniti Di Bergamo, Bergamo, Italy); Lowenstein M (Arthritis Center Palm Harbor, FL, USA); Rodriguez-Lozano C (Hospital De Gran Canaria Dr Negrin, Las Palmas, Gran Canaria); Lue C (Little Rock Diagnostic Clinic, Little Rock, AR, USA); Mahowald M (VA Medical Center, Minneapolis, MN, USA); Maradiaga M (Hospital General De Culiacan Bernardo J, Gastelum, Culiacan, Mexico); Maricic M (Catalina Pointe Clinical Research, Tucson, AZ, USA); Mariette X (Hôpital Bicêtre, Le Kremlin-Bicêtre, France); Martin L (University of Calgary, Calgary, Canada); Massarotti E (New England Medical Center, Boston, MA, USA); Matucci Cerinic M (Ospedale Villa, Monnatessa, Firenze, Italy); Maurizio Montecucco C (IRCCS Policlinico San Matteo, Pavia, Italy); Mazurov V (Medical Academy of Postgraduate Education, St Petersburg, Russia); McNally J (Royal Berkshire Hospital, Reading, UK); Mehta D (Center for Arthritis and Osteoporosis, Elizabethtown, KY, USA); Meyer O (Hôpital Bichat Claude Bernard, Paris, France); Misra R (Sanyai Gandhi Post Graduate Inst. of Medical Sciences, Lucknow, India); Moreland LW (University of Alabama, Birmingham, USA); Mueller Ladner U (Kerckhoff-Klinik Gmbh, Bad Nauheim, Germany); Myerson G (Arthritis and Rheumatology of Georgia, Atlanta, GA, USA); Nasonov E (Institute of Rheumatology Rams, Moscow, Russia); Navarra S (St Luke's Medical Centre, Quezon City, Philippines); Navarro F (Hospital Virgen De La Macarena, Sevilla, Spain); Neal N (Valerius Medical Group and Research Center of Greater Long Beach, CA, USA); Olech E (Oklahoma Medical Research Foundation, Oklahoma City, OK, USA); Olsen N (University of Texas, Southwestern Medical, Center, TX, USA); Pablos JL (Hospital 12 De Octubre, Madrid, Spain); Pacheco C (Hospital Christus Muguerza Del Parque, Chihuahua, Mexico); Pal S (Apollo Hospital, Hyderabad, India); Palomo ER (Multimedica, Vistahermosa, Guatemala City, Guatemala); Pandith V (Jbn Medical Diagnostic Services Inc, Burlington, Canada); Penserga EG (Philippine General Hospital, Manila, Philippines); Prupas H (Arthritis Center of Reno, Reno, USA); Radominski S (Universidade Federal Do Parana, Curitiba, Portugal); Ramos-Remus C (Unidad De Enfermedades, Cronico Degenerativas, Guadalajara, Mexico); Reid D (Aberdeen Royal Infirmary, Aberdeen, UK); Riordan K (Centra Care Clinic, St Cloud, MN, USA); Rosenberg D (Florissant, MO, USA); Ruiz A (Hospital De Cruces, Barakaldo, Spain); Saadeh C (Amarillo Center for Clinical Research, Amarillo, TX, USA); Salvarani C (Ospedale Civile S. Maria Nuova, Reggio Emilia, Italy); Samuels A (East Penn Rheumatology Associates, Bethlehem, PA, USA); Sanmarti R, Sarzi Puttini P (Hospital Clinic Provincial, Barcelona, Spain); Saxe P (Delray Research Associates, Delray Beach, FL, USA); Schechtman J (Sun Valley Arthritis Center, Peoria, AZ, USA); Scoville C (Institute of Arthritis, Idaho Falls, ID, USA); Sedlackova M (Fakultni Thomayerova, Nemocnice, Praha, Czech Republic); Sedrish M (Clinical Research Network, Slidell, LA, USA); Sejer Hansen M (Herlev University Hospital, Herlev, Denmark); Sibilia J (Hopital De Hautepierre, Strasbourg, France); Siebert S (Princess of Wales Hospital, Bridgend, UK); Specker C (Klinik Für Rheumatologie and Klinische Immunologie, Essen, Germany); Stern S (Kentuckiana Center for Better Bone and Joint Health, Louisville, KY, USA); Szechinski J (Medical University of Wroclaw, Wroclaw, Poland); Tahir H (Whipps Cross Hospital, London, UK); Taylor A (Royal Perth Hospital, Shenton Park, Australia); Thompson PW (Poole General Hospital, Poole, UK); Tony H-P (Medizinische Poliklinik Der Uni Würzburg, Würzburg, Germany); Tornero J (Hospital General Univ. De Guadalajara, Guadalajara, Mexico); Trapp R (Arthritis Center Springfield, IL, USA); Tremblay J-L (Centre de Recherche Musculo-Squelettique, Trois-Rivieres, Quebec City, Canada); Valesini G (Policlinico Umberto, Universita' La Sapienza, Roma, Italy); Van Den Bosch F (Universitair Ziekenhuis, Gent, Belgium); Wanchu A (Post Graduate Institute of Medical Education and Research, Chandigarh, India); Wassenberg S (Evangelisches, Fachkrankenhaus, Ratingen, Germany); Ximenes AC (Hospital Geral De Goiania, Goiania, Brazil); Youn Kim H (Kang-Nam St Mary's Hospital, The Catholic University of Korea, Seoul, South Korea); Zanetakis E (Oklahoma Center for Arthritis Therapy and Research, Tulsa, OK, USA); Zazueta B (Unidad de Reumatologia, Rehabilitacion Integral, Mexico); Zerbini C (Hospital Heliopolis, Sao Paulo, Brazil). Funding Financial support for this study was obtained from F Hoffmann-La Roche Ltd, Genentech Inc and Biogen Idec. This work was supported in part by NIH grant M01 RR00043 to the General Clinical Research Center at the University of Southern California Keck School of Medicine, Los Angeles, CA, USA. Competing interests PPT has served as a paid consultant to Abbott Laboratories Ltd, Astellas, AstraZeneca, Bristol-Myers Squibb, Eli Lilly and Company, Funxional Therapeutics, GlaxoSmithKline, Johnson and Johnson, Merck Serono, Novartis, NovImmune, NovoNordisk, Roche and Wyeth Pharmaceuticals. He has been paid lecture fees by Abbott Laboratories Ltd and Roche and received a payment from a commercial entity that sponsored the study (Roche), and received grant support from The Netherlands Organization for Health Research and Development (ZonMw) in assignment of The Netherlands Organization for Scientific Research (NWO), the Dutch Arthritis Association, the European Community, SmartMix SenterNovem (NWO and the Dutch Ministry of Economic Affairs), Bristol-Myers Squibb Int. Corp, MedImmune Limited, Merck Serono SA, Novartis Pharma AG, NovoNordisk A/S, Roche and Wyeth Pharmaceuticals. WFR has served as a paid consultant for Roche, Genentech and Biogen Idec, has been paid lecture fees by Genentech and Biogen Idec and has received grant support from Roche. AR-R has served as a paid consultant to Roche, Wyeth, Chugai, Essex and been paid lecture fees by Roche, UCB and Bristol-Myers Squibb. CGP is an employee of Spire Sciences LLC which provides clinical trial services to pharmaceutical companies. RFvV has served as a paid consultant, been paid lecture fees and received grant support from Roche. WS has served as a paid consultant to Human Genome Sciences and has received grant support from NIAMS, Genentech, Human Genome Sciences, Arthritis Foundation Southern California Chapter and Xencor. EH holds shares in Roche and is an employee of Roche. AC is an employee of Genentech, a member of the Roche Group. HT is an employee of Roche and has received payment from a commercial entity that sponsored the study. TMS holds shares in Roche and is an employee of Roche. Ethics approval The study was approved by the institutional review board or the ethics committee at each study site. All patients gave written informed consent.